A Cheerleader Fundraiser can come in many forms and methods. And not only will it raise funds, but it will also create more SPIRIT amongst your Cheerleading Group! The really great thing about a Cheerleader Fundraiser is that you already have a group of people that are passionate about their team, their cause, and will therefore be passionate about fundraising for it. Use this fact to your best advantage to to get the most out of your fundraising efforts. Set a goal. Make it realistic! Choose the right Cheerleading Fundraisers. Fundraisers that your Cheerleaders will be excited and passionate about. Get everyone involved. Cheerleaders, coaches, and family. And build excitement with them about the Cheerleading Fundraiser. Look to increase funds raised with extra offers to your main fundraiser. Have popular and high demand products like Apparel, Bracelets, Cookie Dough, etc..
Offer them at good prices. Have a sales pitch guideline to teach to your members. Have an additional offer so that the potential supporter have another option if they don't like or want the first product offer. Look to sell your products online as well, like with the Online Apparel Fundraiser or through Fundraising.com's Online Stores! Have an incentive program for extra motivation. For example a prize for the best seller! Keep accountability on jobs to be done and on funds raised being handed in. Celebrate! You're building spirit so when your fundraiser is over it's time to celebrate with your Cheerleading team and congratulate them! And lastly, but really importantly... Thank everyone involved!!! Apparel Fundraising is a fundraiser that most organizations should be using. There are so many facets and products items to use that you will always find an angle to make it successful, no matter what your cause! So setup your free Online Apparel Store through SSA Apparel, which you can then use to stock your offline sales! Running a donations fundraiser online is becoming a really popular and effective fundraising method for many groups and if you get your whole team to promote it, you can make this fundraiser really successful. Read through all 3 pages of the Online Donations Success Article and then setup your Crowdfunder here. And also the printing and shipping of the shirt. Signup and Create a Fund. Design your custom Cheerleader Supporter T Shirts. Set a price. T Shirts have a base sales amount, which you then add a donation amount on top of, to set the price. That donation amount is yours to keep entirely. Then launch your fund and promote, promote, promote!!! And finally raise funds through Shirt Sales AND general donations! Take a look here to see who else has been successfully fundraising with this unusual, yet brilliant fundraiser. A Dance-a-Thon is the perfect Cheerleader Fundraiser! Your team will have loads of fun with it and you can raise stacks of funds! Setup a Pledge Website and get supporters to pledge funds for every hour of your Dance-a-Thon! Then look to add other fundraisers to your event, like product sales or Apparel Sales! Read the Walkathon page to find out how to hold a fundraiser of this type successfully. Product sales will always be a great fundraising method especially for Cheerleading groups! So choose the right products for your group and its supporters! Grab this Free Fundraising Guide (USA & Canada) to see what Fundraising Product options you have. 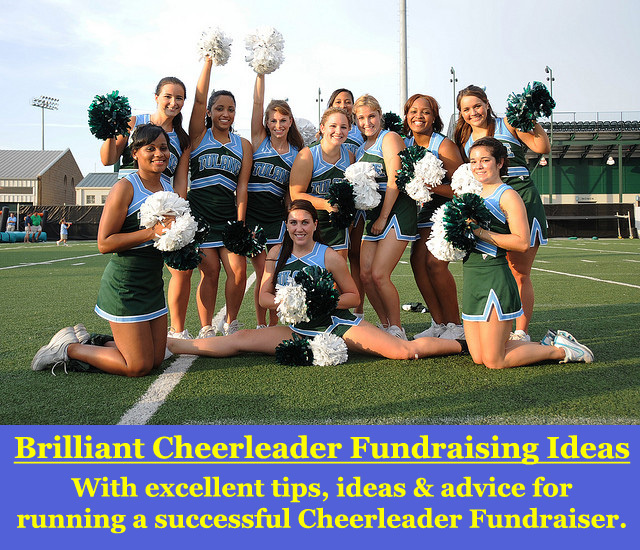 Any fundraiser involving sports will likely work exceptionally well as your Cheerleader Fundraiser. Obviously choose sports that are popular in your town and for your supporters! For some great Sports Ideas read here. Or you can sell actual Stadium Seats from your SSA Apparel Store for all the sports events that your groups cheers at! Either way it's the perfect fundraiser for a Cheerleading group!!! 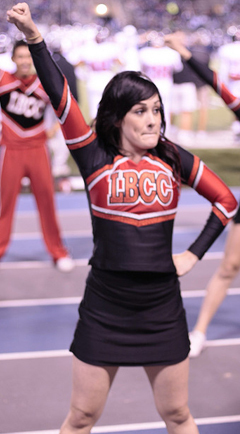 For more great Cheerleading Fundraisers read here! Providing the most successful fundraising products available. Grab your Free Info Kit here. Then you'll need the right software - check it out here.